New goodies are always so much fun. I went to lunch with a friend and we found some fabulous treasures, then a box came in the mail, plus goodwill was loaded, so wow, I had a great week. Do you just squeal with delight when a package comes in the mail, I do, and this was such a perfect gift from one of the most precious people I know. Just look at this pumpkin, isn't it wonderful. 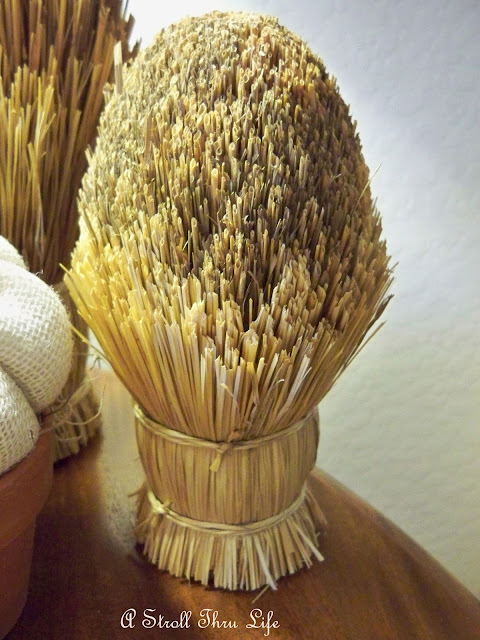 Bleached burlap and look at the stem. How gorgeous. Of course I immediately had to create a vignette to showcase it. And the momma too. (I need to figure out something to replace their top feather - any ideas) They were a great find for $2.99. Then Saturday a friend and I went to lunch (after a tour of her unbelievably amazing home) and then shopping at a thrift and consignment store. I found a pair of wheat spheres. This is the smaller one. This is the larger one. 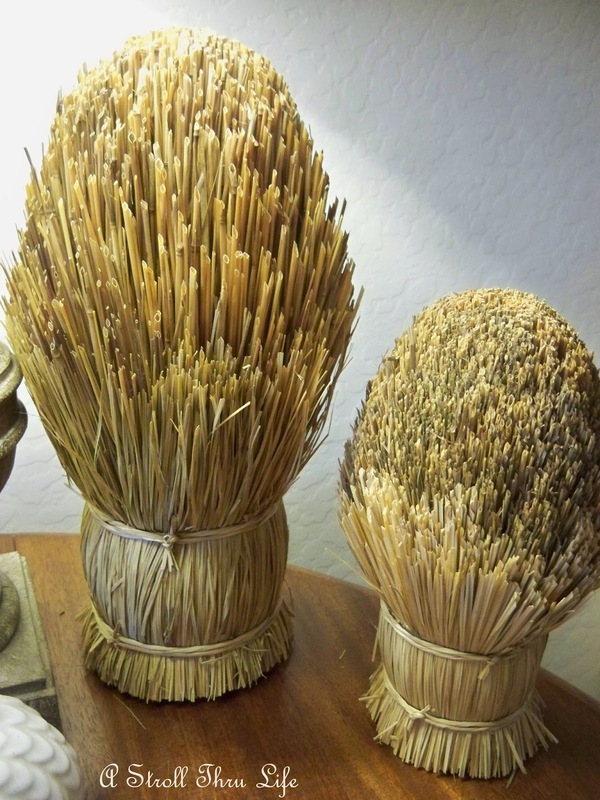 I havn't seen these before, but you can see it is simply wheat stalks bundled and then sheared in the shape of a sphere. The larger one is more open than the smaller one. Love these. I think these were a fabulous bargain for $5.95 and $7.95. I thought all three went together as a fun new vignette for the end table. Thank you so much Pat for the pumpkin, I absolutely love it. So, did you find any treasures lately? I found a couple more treasures that I will share later. Super cute vignette and what nice scores you got. Love the quail so adorable. Your pumpkin you got it so sweet. Very cute. Love that pumpkin ! Your other thrifty treasures are great finds ! They all look perfect together ! LOVE IT Marty!! 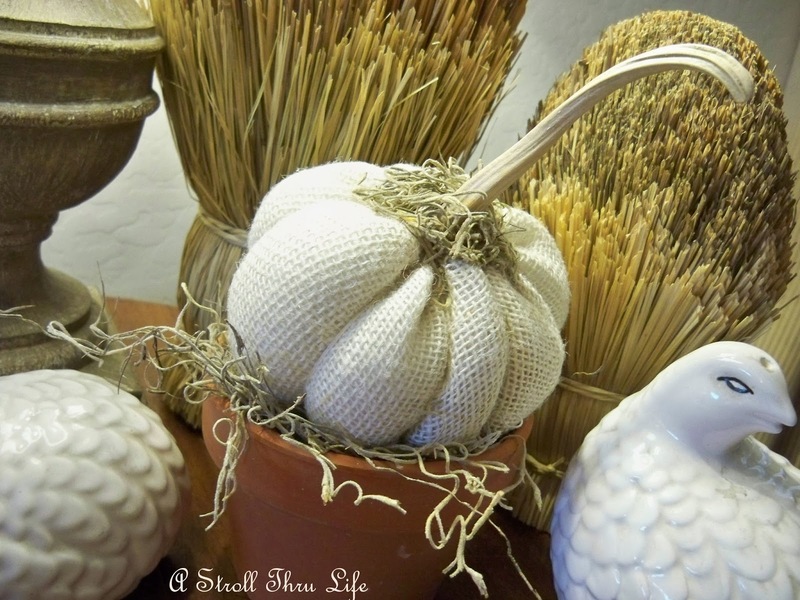 Those wheat bundles are so pretty and I love the pumpkin in the clay pot! Love this, Marty. The textures and ivory are perfect together. Very nice! I love the pumpkin, Marty ... what a great gift! And, your quail and wheat were amazing scores! Beautiful vignette, as always! Great finds! Love the vignette! It's really so pretty Marty! I love the wheat stalks a lot, it's a perfect fall 'bouquet'! 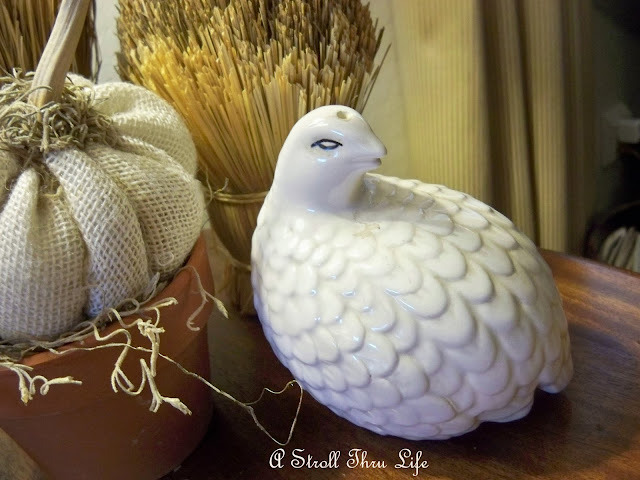 What a pretty vignette....I so love quail... you find the greatest things!!! You're right, Marty, that pumpkin is too cute! You always find the best stuff at GW. Seems like I never have any luck there. I think the GW's in my town have their prices set too high and it irritates me, so I wind up not buying anything. :-/ Anyway - love the little vignette that you put together! Don't you love when you have those kind of days Marty? Your vignette is really cute! You put together a nice vignette using your new treasures, Marty! 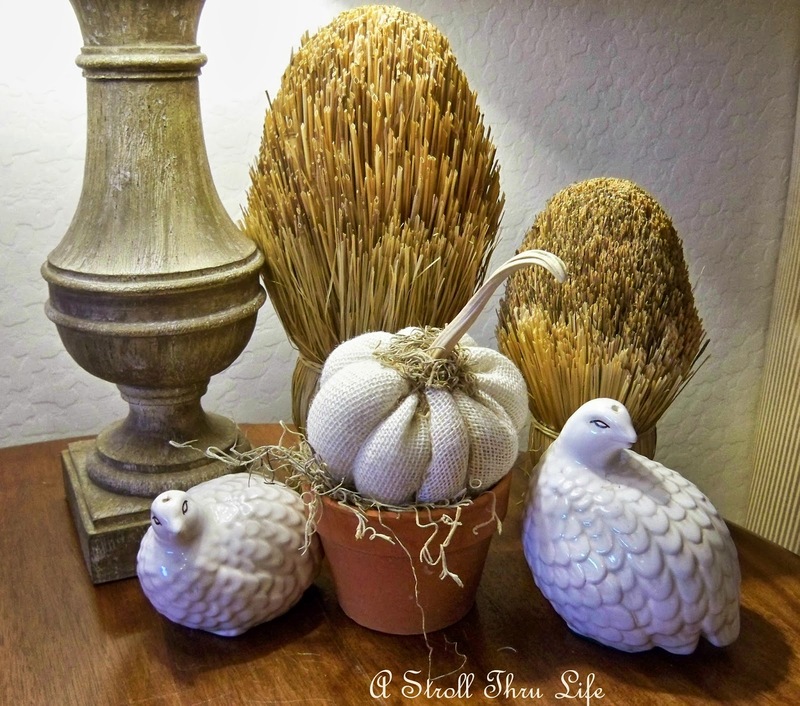 Love the wheat and the quails are cute. It Looks Beautiful! I love your vignette! Those are pretty! Especially that pumpkin...too cute! Hi Marty, nice vignette all your new treasures are so beautiful! Marty, lovely I think the quails really added the finishing touches to your vignette. Hobby Lobby has a superb selection of feathers-that might be a place to start! Love those wheat spheres you found! I've never seen ones like that before. Beautiful vignette! I love your vignettes, Marty! They always turn out so well. Those are some great finds and you are right, they do go together wonderfully! 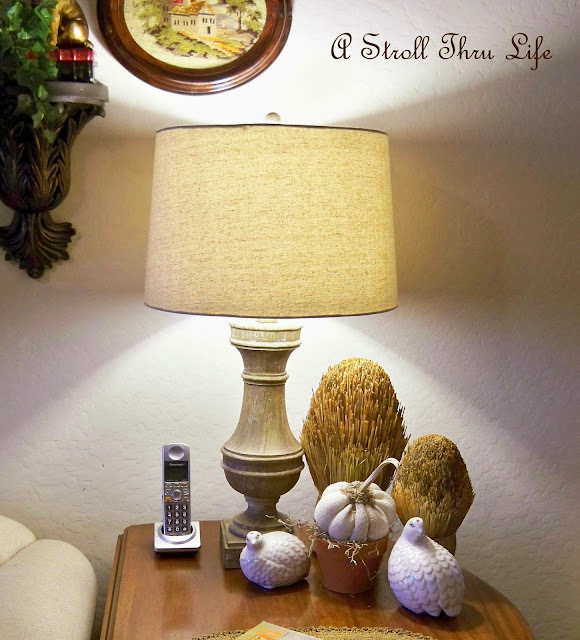 Love the neutral tones which look terrific under your lamp/shade. The wheat spheres are fantastic! So pretty Marty. 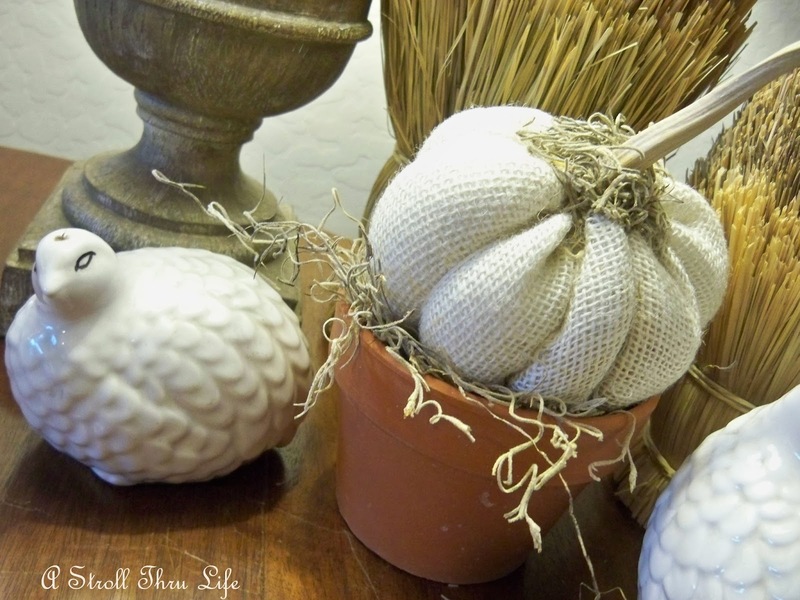 I want to make a burlap pumpkin. I may have to do that:)! So cute. Love the wheat too, very neat. Wow Marty! I love all the colors of beige and white. I have been looking for two more pieces for my dining room table and wish I could pick from yours! Just lovely! Such a beautiful vignette! I have never seen wheat spheres before. They are really neat looking! I love your vignette because it is SO Fall and it is not gold, or orange or brown! So pretty! Visiting from Thursday Favorite Things. A cute way to bring some nature in the house, Marty! Thanks for sharing at Throwback Thursday.